You can add this calendar to your Google calendar so you can always see what’s coming up! 2) Go to calendar.google.com. On the left side of the screen, there is an "add calendar" button with three dots next to it. Click the dots, then click add "from URL." Paste the address into the box that pops up. Voila! the calendar has been added to your Google account. 3) From here, you can add the calendar to your devices, such as your phone and tablet. 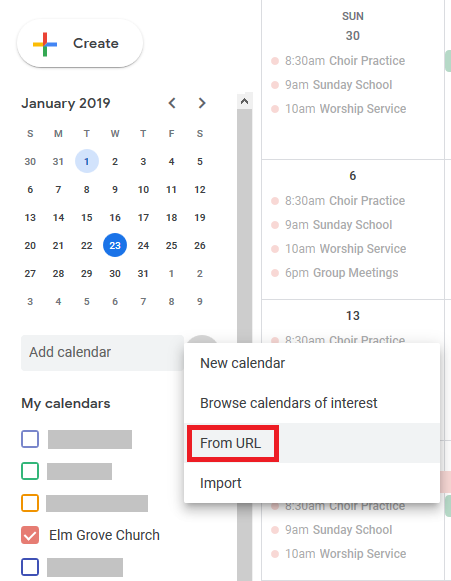 There are too many different devices for one set of instructions to cover them, but you can do a search for "Add google calendar on [my device]" and find out the specific steps you need to take. Of course, we're not taking down any methods of seeing the calendar. There will still be hard copies, and you can still find it here our our website. This is just an option for people who want another way to stay informed.